Tim Smith has a real knack with texture. That may sound notional, but all of his reds – and I’m largely talking reds here – have a generosity that I suspect has broad appeal. I want to call it softness, but it’s not actually soft. Seamless is a better description.Whatever you call it, Tim’s wines have it. This blend certainly does. A flip-of-the-ratio MGS matured in old oak, it is a purple-edged, entirely juicy red that flows with tarry redcurrant and raspberry liqueur, the oak (welcomingly) adding nothing, the fruit all on show. 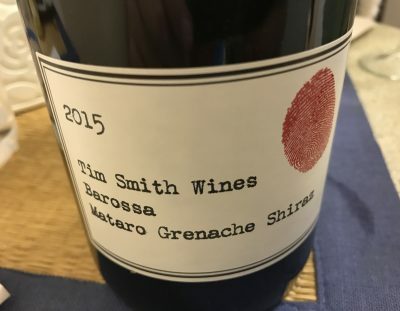 The star of the show here is the Mataro and Grenache, which together give this blackberry and charcuterie without the plum of Shiraz really dominating. It’s GSM Jim, but not as we know it. There’s a little spirit on the tail, which is mildly distracting, but the length helps you get over that. This is a real, generous, Barossan red that flows seamlessly in an almost cosy (ie nothing sticks out, it just rolls) fashion. Much to like. Actually, the only thing standing between this and greatness is that warm edge. Best drinking: 2017-2027. 17.8/20, 92/100. 14.5%, $28. Would I buy it? I’d happily drink two glasses.